Mountaineer and adventurer Katja Staartjes: “Are you looking for a speaker to inspire your team and company? My story motivates your people and stimulates improved teamwork and cooperation. This enables you to go to the very limit to achieve the best possible result. My story is based on my personal experiences as Himalayan mountaineer and expedition leader. Combined with my background in senior management roles, I can well make the translation to your organisation and situation. My expeditions in the Himalayas have shown me clearly that team spirit and teamwork is essential to perform. And that is no different within organisations. 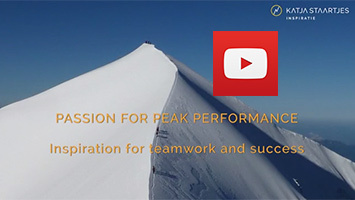 The intense and extreme experiences in high mountain ranges form a powerful metaphor to inspire your teams to realise win-win situations and ambitious results. I customise the speech both in terms of duration and content, and focus is possible on certain themes. If required, certain issues can be developed in an interactive way. Should the emphasis be on interaction, the session can be extended by a half day or a full day, depending on what you need. The experiences I gained in my expeditions to peaks such as Mount Everest and other 8000+ giants, are illustrated with images. By the photos and the intense experiences in the high mountains, my story comes to life. It is as though you are yourselves in the Himalayas. The comparison I make with issues you face in daily practice then becomes tangible. If you would you like an motivational story with impact please complete the form or call Katja Staartjes (The Netherlands) at +31 6 212 742 82.